Sailing Yacht Aegir is Brian Benjamin's Carbon Ocean 82 superyacht measuring 25.1m (82'4'') launched in Newport at the end of 2010. 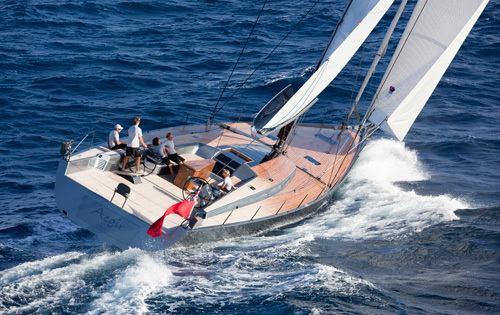 The cruiser racer Aegir II has been constructed at Carbon Ocean Yacht to a design by Rogers Yacht Design. 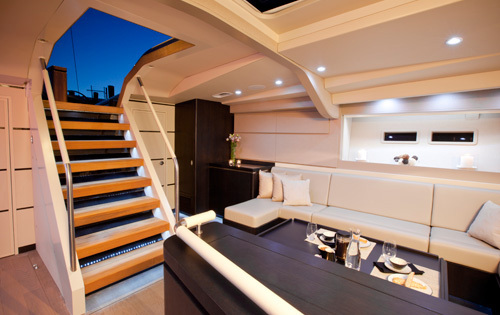 Aegir can accommodate up to 6 charter guests and sails throughout the South of France. 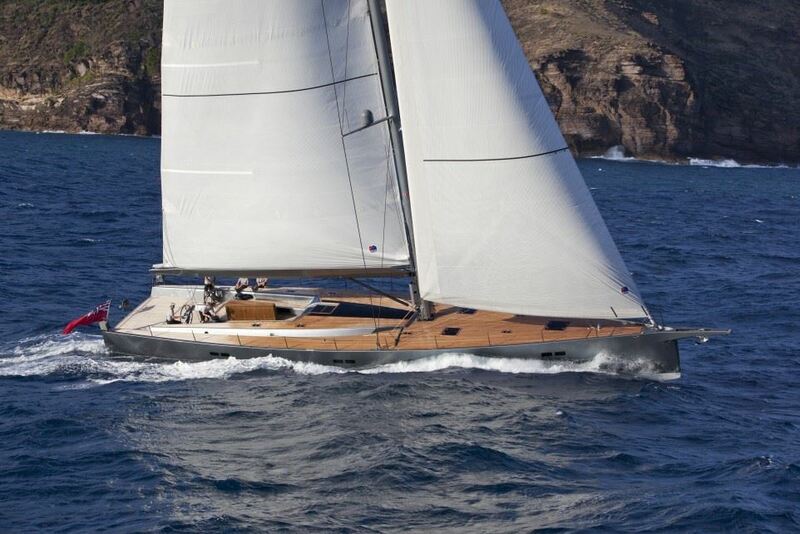 Sailing yacht Aegir II is constructed entirely from pre-preg carbon utilizing the latest aerospace technologies. In race-mode, velocity prediction analysis suggests an upwind speed of 10.5 knots and a capability of 20 knots downwind. 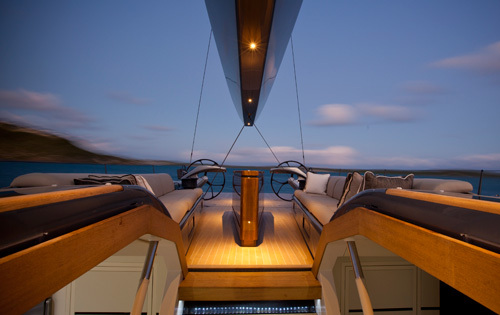 Carbon Ocean 82 sailing yacht features elegant lines and her three spreader carbon rig, towering 35 metres above the deck, provide some serious horse-power. The masthead asymmetric kite is 650sqm. Rogers Yacht Design has transferred many of the technologies used in their racing yachts to guarantee a light, stiff and robust structure. An extensive tank testing and CFD program has been completed, to optimize the hull form for the IRC rating rule, making her a perfect choice for the Cruiser Racer class for the Med circuit as well as luxury yacht charters. Considerable effort has been spent on ensuring that all the sail handling systems are fit for racing and every manoeuvre can be achieved with minimum effort, whilst the aesthetics of the design are also respected and comfort maximized for extended cruising. 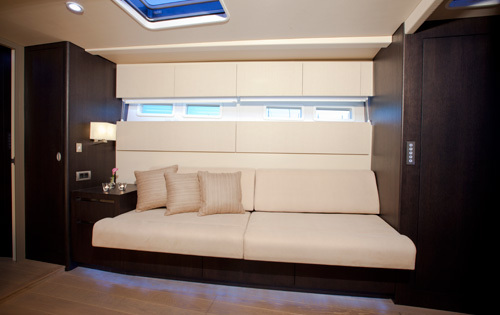 Sailing yacht Aegir II’s interior is light and contemporary and allows the owner to occupy the whole yacht from the saloon forward and gain a high degree of privacy, whilst also being able to create two separate cabins forward when cruising with guests along with an additional twin guest cabin that can accommodate up to 3 children. The saloon is spacious with an open plan layout, and a rise-and fall table that can convert a formal dining area into a relaxed place to enjoy the state of the art multimedia systems in an informal surrounding. 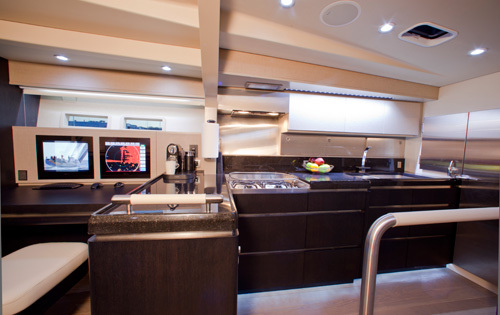 The large and fully appointed galley allows the chef to create fabulous offerings with ease. Charter yacht Aegir is able to accommodate up to 6 guests overnight. 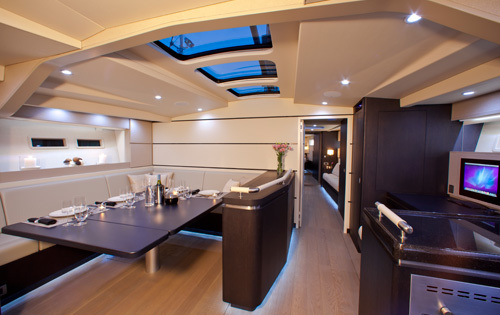 Her interior is very spacious and well-appointed which utilises ultra-high quality materials to produce a warm and contemporary environment for charter guests below decks. 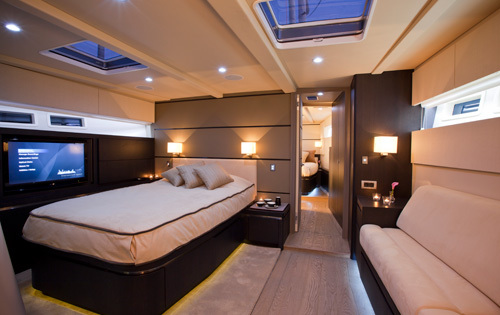 The owner’s suite is amidships and features an enormous bathroom with wet room shower. This suite can either be full beam or closed-off with the use of soundproof pocket doors that create a corridor to the generous VIP suite forwards, again with an oversized bathroom. 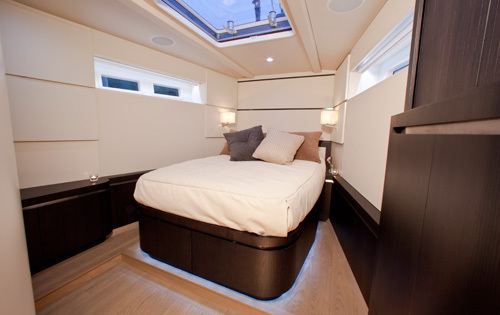 A twin cabin with ensuite bathroom completes the guest accommodation, all of which have excellent storage and the owner’s suite and VIP have integrated multimedia systems. 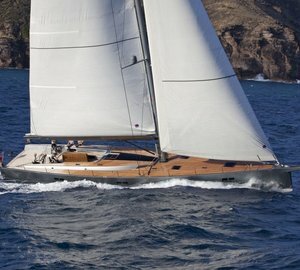 The AEGIR sailing yacht has the following Tenders & Toys: Williams 325 jet tender, Wake board, Towables, Snorkelling equipment. 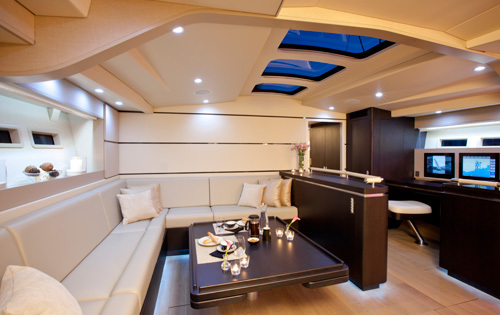 Audio Visual Equipment and Deck Facilities include a 37’’ Sharp in Salon and 32’’ Sharp in both owner’s and VIP, 1 x portable docking station and wireless connection in 4 different zones on board which can be accessed by guests from the boat's iPad or personal apple devices. Apple TV throughout (except for the twin cabin). AEGIR also has WiFi via 3G.